Just over one hundred students attended our Cake Me! kids Term 3 School Holiday program, and what an incredible time we all had! The students ranged from five to 15 years of age, all with varying skills and abilities. A few students came with an impressive lot of experience with fondant, but mostly students had very little experience or none at all. It was lovely seeing so many familiar faces and also meeting a whole new bunch of wonderful kids. As I explain to all my students, no matter if you're five years old, or eighteen years old, you can still attend these sessions and have so much to learn. Even for me, I find myself always improving upon my own skills. Whilst a five year old may be attempting to sugar sculpt a monkey's head, the eighteen year old could be making sure the monkey's head is smooth and wrinkle-free. Both kids might be creating monkeys, but they end up with very different results. Week One of the school holiday program was so exciting for my cheeky monkeys and I, I mean, for my students and I. As requested by the students from my previous school holiday program, Week One saw us sugar sculpting monkeys. The class was quite intensive and we had so much we needed done in the ninety minute session. One of my first-time students, C*, showed me a photo of an incredible animal cake she had recently made. 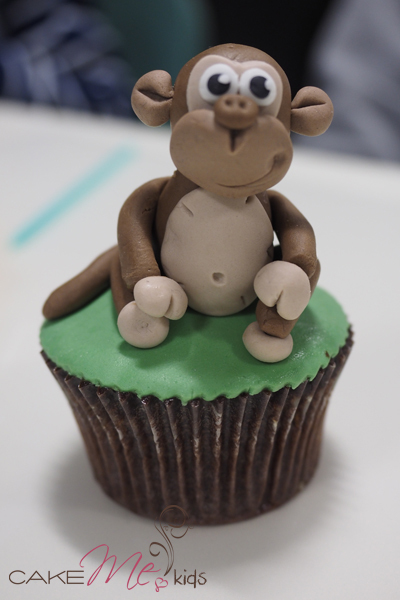 Even though she was quite experienced with fondant, she was still blown away by the monkey she learnt to sculpt in our class. It was K*'s second time with us at the school holiday program, but this time she brought along her older brother. Although K* is only five years old, and her brother is 7, K was the "experienced" sibling, so she was even able to give her older brother some help with his monkey. Her skills had definitely improved since we last saw her, it is amazing how quickly these little ones grow and learn. Eleven year old E*'s mum was hesitant when she dropped him off as she was worried he was too old for the class. I was so pleased that E loved the class so much that he signed up to a second class in Week Two and had an amazing time there too. 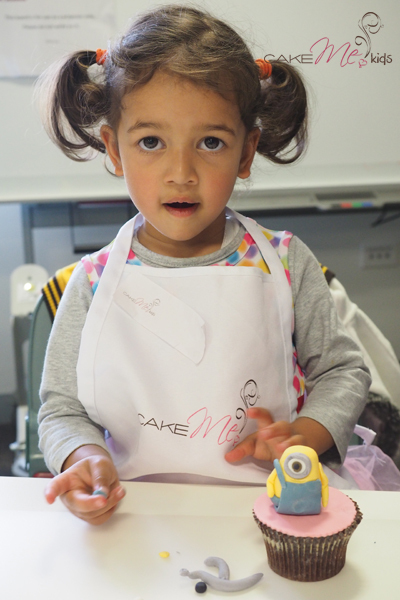 Minions were the theme for Week Two of the Cake Me! kids School Holiday Program. The kids and I had a blast creating our minions - with the kids starting off following my instructions very carefully, and then giving their "Bobs, Stuarts and Kevins" its own personality. It was such a joy for me to see how confident the students were with experimenting and doing their own thing, after starting off being extremely cautious. By the end of the class, we had minions flexing their muscles, minions with their own bananas, afro-minion and minion girls complete with eyelashes. My workshop series was small and intimate so I was able to give the students my undivided attention. 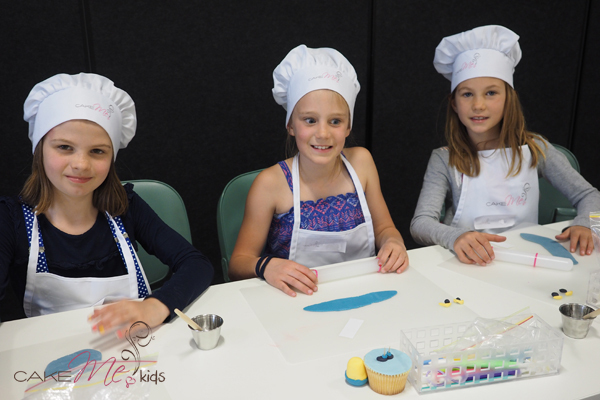 As it was a workshop series, the students were able to learn from the very basics to more advanced sugar sculpting and cake decorating, and develop and build on their skills from the first class to the fourth class. I loved getting to really know these students. It was uplifting knowing that I had played a small part in their lives and inspired some of these young people. My eight year old workshop student, P*, who had also attended my previous holiday program, now dreams of opening up her own cafe one day. I felt this overwhelming sense of pride when her mum showed me a photo of the magnificent hamburger cake that the eight year old created after attending my session and she was able to use the skills and passion that we instilled in them. I know I didn't actually play a part in making the cake myself, but I felt so much pride. It was incredible. 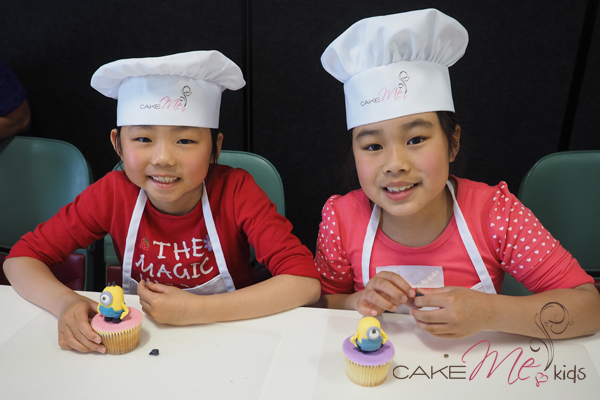 Eleven year old workshop student, G*, has seen every episode of Cake Boss and all the different cake shows. This was G's first Cake Me! kids experience and she dreams of opening up her own bakery and has even named it "Sweets and Treats". After the 2D monkey cupcake session, she went home the next day and made another six monkey cupcakes. Her mum told her that they were good enough to sell. She asked her mum how much would people buy them for? She then decided that after four hours work, no amount of money would be worth her time, she would rather eat them all herself. I have to say, that I feel that same way all the time! 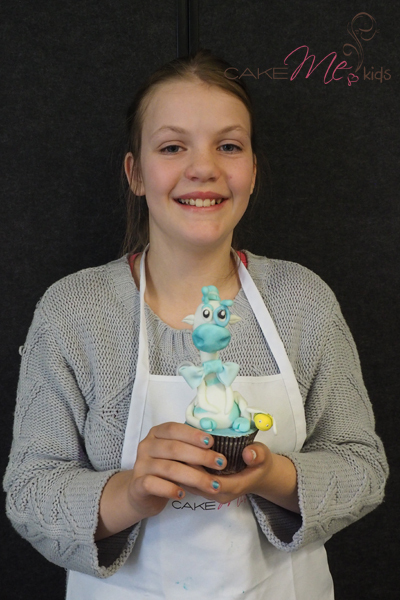 The third and fourth workshop in the series was dedicated to sugar sculpting Gemma the Giraffe. The word "amazing" just doesn't do it justice. I was totally blown away by how much love and patience was put in these giraffes and the end result was totally mind-blowing. These students ranged from eight to fourteen years of age, but if you saw their creations, you would not have known. I loved seeing the students utilising the skills learnt from the first three classes, in personalising their final showpiece giraffe in the fourth class. We not only ended up with Giraffes, these creative students also sculpted "zebraffe" and "gragon". 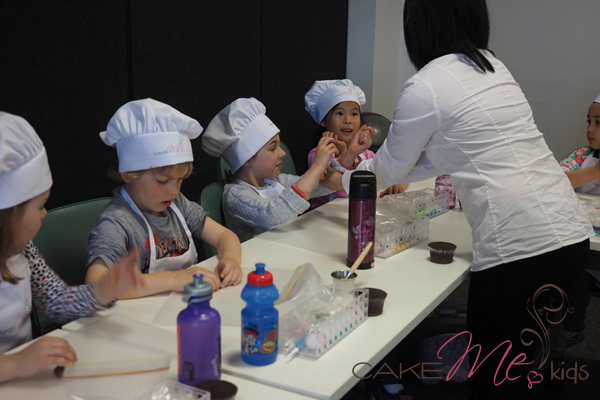 We look forward to seeing all your gorgeous faces again at the next Cake Me! Kids School Holiday Program.